The mighty Atom. Having conquered the very same netbook market that it helped to create, we're now finding the processor seeping into other computers – non-portable ones. And, as demonstrated above, it's even got the processor oomph to power an all-in-one touchscreen device, such as MSI's latest Wind Top AE1900. MSI has always been slightly ahead of the game as well, whether that's with its neat little Atom-based Wind netbooks, or the introduction of its rather lovely motherboards. MSI's latest, the Wind Top AE1900, has the dual-core iteration of the sprightly little fella at its core, and it's by far the sleekest all-in-one PC we've looked at so far. 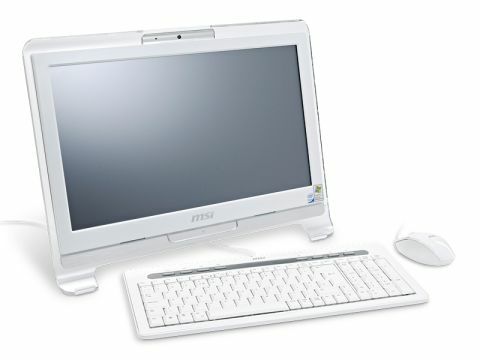 The display is vital in any touchscreen computer, and the Wind Top AE1900 is exceptional in this respect. The first thing you notice is how wide it is, discarding the conventional 16:10 format in favour of more cinematic 16:9 ratio. This makes it ideal for watching films, and something of a workout to merely drag the cursor from one side of the screen to the other. The display's performance is stunning, with good colours and a sharp, bright picture. The 720p video we tested on it stalled a tad when played with VLC, but using the Combined Community Codec Pack (CCCP) ensured slick, smooth playback. It's a shame that Atom-based systems are pretty much incapable of gaming, as this would be a wonderful system for blowing up badduns. We'd love to see a similar system based around Nvidia's Ion, which would give it that little bit more power for gaming and hi-def video playback. The Wind Top does include a few touchscreen-specific apps on top of its Windows XP Home installation. There are also a couple of genuinely odd webcam-based games, such as MSI Space Game and MSI Chicken Game, in which you use your head movements to control a spaceship and, um, a chicken. Project Natal it ain't, but it's still quite good fun. A genuinely useful app is SoftStylus, which does away with the need for a physical keyboard in favour of an onscreen iPhone-esque one. But unfortunately the handwriting recognition option leaves a lot to be desired. MSI has also missed a couple of tricks, in that there's a glaring lack of wall-mounting fixtures and it's failed to chuck a remote into the bundle. It's not exactly cheap, but the Wind Top is an eye-catching, head-turning PC, and if you install Windows 7 you'll have quite possibly the best PC in the world. Unless you want to play games.